In Part 1, we introduced Change Management (CM) as it relates to workplace design. In Part 2, we highlight a Case Study of one organization that first implemented CM for a 450-staff renovation project, and continues to provide CM as a value-add process for subsequent smaller projects. What would you do if you had to announce to 450 staff members that they would be relocating — for two years — to a former call center while their government office building was gutted and renovated? And what would be the reaction of six elected officials and 100 others when they learned they would lose their private offices and, instead, sit in open workstations in their temporary swing space? The administration of Howard County Government recognized that these factors represented significant cultural change for their staff as well as the public they served. A fast track schedule added “a sense of urgency,” which John Kotter has identified as the first step to affecting real change. [i] The County wisely chose to immediately launch a Change Management (CM) program to parallel and support the design processes for both the Swing Space and the Renovated Space. One member of their design team facilitated the CM program. Staff members were encouraged to test drive 6 chairs and vote for their top 2. One of the finalists was ultimately selected as the typical task chair. The branded CM program — called Renovation 360 — also served to centralize communications for the renovation project, thereby maintaining high productivity for both the management and staff. So instead of being plagued by rumor mill and gossip chats, Renovation 360 facilitated transparency in communications with a robust intranet site with FAQs, floor plans, move schedules, status photos, and helpful resources. An active 15-member Renovation 360 committee met regularly for more than two years to advocate for their departments and for the improvements that the relocations would provide. These change agents were important liaisons, keeping their ears to the ground for rumblings of concerns, and then bringing their observations and insights for the committee to listen and make recommendations. Renovation 360 committee members tour the former call center that will serve as their temporary offices for 2 years. Because a successful CM program depends on input from those affected by proposed changes, activities and deliverables are evolutionary in nature. For instance, halfway through the renovation project, the Renovation 360 committee learned that a former time capsule from 1976 needed to be relocated. They recommended that a new time capsule be installed adjacent to the former, and then worked with their respective department colleagues to gather items to place into the new capsule. This activity provided an enjoyable way to involve more staff in the change, and it highlighted the significance of the renovation project. All of these efforts combined to assure that the staff would be productive from Day One in their new work environment. Open collaborative areas were part of the cultural transition for some Howard County staff in their renovated building. Perhaps the most notable impact of the CM program was its contribution to the successful transition of staff from their 25 percent enclosed/75 percent open work environment to the former call center swing space, which was 100% open. For two years, 450 staff members — including elected officials from opposing parties — learned how to work and function in an open plan. Most of the staff occupied workstations that were just 5’ x 10’ (two 5’ x 5’ call center workstations with panels removed), with slightly larger workstations for department heads. Virtual tours of the former call center helped to prepare departmental staff to expect low partitions and smaller workstations in their temporary offices. This openness, especially in the “public counter” areas, truly represented a huge cultural transition. Many doubted that it could work. And yet, it did, quite successfully. Most staff members credited the efforts of the Renovation 360 committee members and their encouragement to observe Open Plan guidelines. 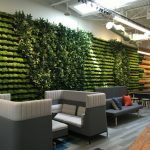 In fact, after their move to their permanent and newly renovated offices, many commented that they actually missed the connections they enjoyed in such as widely transparent space. Howard County’s two successful relocations in 2008 and 2010 set a precedent for subsequent CM programs. In fact, the Howard County Health Department will relocate permanently in 2013 to Ascend One, a former call center that is being renovated to meet their needs. Logo for the current Change Management program supporting the relocation of 120 Health Department staff in May 2013. “Ascending As One” is the Health Department’s branded CM effort, and a 12-member committee is working to assure that their relocation will be as successful as the County’s previous CM programs. Howard County’s leaders and staff members have clearly experienced the benefits of carefully orchestrated CM programs — and now have become strong advocates for continuing the practice. Interior design by Arris, a Design Studio, Inc. and AvancÃƒÆ’ ©, LLC.